Bedford forwards coach Martin Hynes was full of praise for the Blues after they defeated Rotherham Titans on Friday night, writes Daryl Greenland. 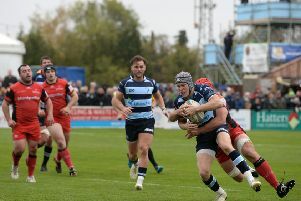 Bedford went into the game knowing they’d have to be at their best if they wanted to get anything out of the fixture, and Hynes believes that the Blues duly displayed some of the finest rugby he has seen at Goldington Road this campaign. Hynes said “Our defence was fantastic throughout the whole 80 minutes and we have to give credit to Rotherham for fighting back the way they, did but the boys stood their ground and held on for the win. “The first 60 minutes of tonight’s game is definitely up there with the best rugby we’ve played this season. Bedford leapfrog Rotherham to go fourth in the Greene King IPA championship, and it reflects the fine start that the Blues have had to this campaign. The Blues haven’t had the easiest of fixtures up until now, but Hynes added: “If you look at the games we’ve lost this season they’ve been very competitive in all areas. “We worked ahead of the Titans game on bringing every area up to the same standard. The composure and the desire from the boys to play rugby has also helped. “We’re convinced that we have a strong squad here this season and the results are proving that. We’ve come up against some of the toughest sides in the league already and we’ve secured some vital points from these games which has left us in a good position looking at the table. Bedford go back on the road again next Saturday as they play away against Ealing Trailfinders which looks like another exciting encounter for the Blues.